Ocean breezes kept Boston significantly cooler than inland areas yesterday. It stayed in the 40s much of the time along the coast while inland areas saw readings approaching 60F. Eventually, the ocean air made it further inland and temperatures dropped quite a bit in the evening. Today is Patriot’s Day a.k.a. Marathon Monday. Some of you may be running today and the weather looks super. I put the Celsius temperatures in parentheses for those not accustomed to the Fahrenheit scale. Cold readings early this morning in the lower 30s (1C) continue to rise into the 50s (10-15C) by 10 or 11AM and the upper 50s to upper 60s (15-20C) in the afternoon. Hopkinton will be about 67F (19C) around 2PM while it remains in the upper 50s to lower 60s (15C) in Copley Square with a bit of an east wind. The image below shows temperatures this morning just prior to sunrise. This next image is a predicted high temperature map along the course. You can see how uniform readings are until you get near the water where they fall back a bit due to the sea breeze (head wind) from the east. It’s likely in the 50s along the course between 10 and noon. 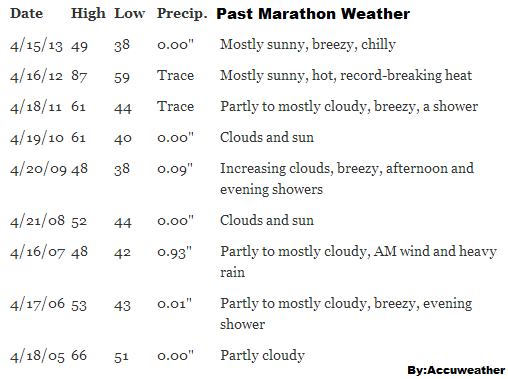 Those winds will be light and give runners a bit of a head wind as they approach Boston. The chart below shows the hour-by-hour temperature and the symbols under the temperature are the wind. These temperatures are for the middle of the course around Wellesley. The sun this time of the year is equivalent to the strength of the sun around the latter half of August. Whether you are going to the Red Sox game this morning, watching the runners along the course or just enjoying a super late April Day, don’t forget the sunscreen. It’s been a long winter without much exposure to sunlight for many and I’m not sure you want to start off the spring with a sunburn. There have been years when it’s cold and rainy or blazing hot for the race. I would estimate today’s weather to be about as ideal as possible for both runners and spectators. The runners might like it a tad cooler in the afternoon, but it’s going to be pretty good. 1976 was one of the hottest races on record, but as recently as two years ago, the year without a winter it approached 90F during the race. Tuesday features more sunshine with mild air and temperatures in the 60s. You will notice some thickening clouds for the second half of the day and a chance of showers follows overnight. The rain won’t last long and by Wednesday sunshine is back. Temperatures will be seasonable for the second part of the week, mostly in the 50s during the day and 30s at night. The dry and sunny weather remains through the work-week with temperatures very typical for the last full week of April. Thursday will see readings in the mid-50s and by Friday many areas will once again reach 60F. Weekends are very important in spring and summer for outdoor activity. I would not recommend changing any plans for the upcoming weekend as forecasts change. However, if you have flexibility on your activities, Saturday is looking like the day when we do have a chance of showers. As the week progresses the timing and amount of possible rain will be better known and I will relay that information to you.